Enter your hosting cPanel and go to Software => Site Software. Please note! If you have Wordpress already installed on one of your domains, this link will be shown as "WordPress (1 installed)" and will redirect you to the Manage section. 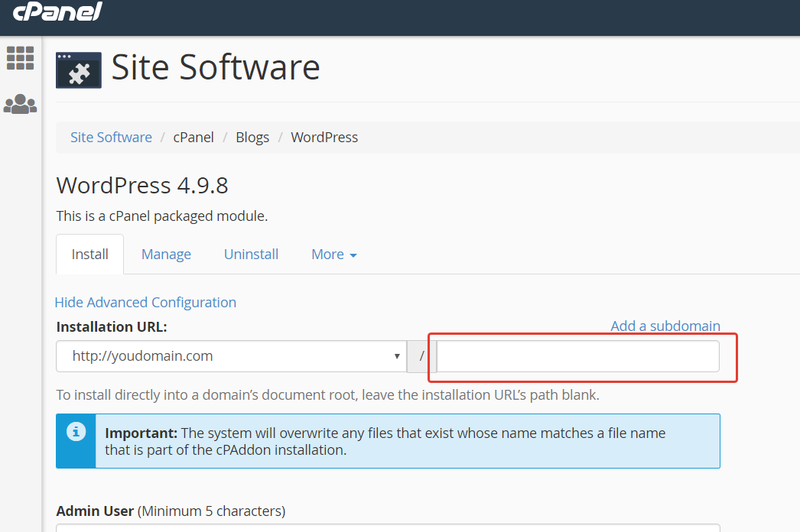 You will need to switch to Install section to setup Wordpress on the necessary domain. 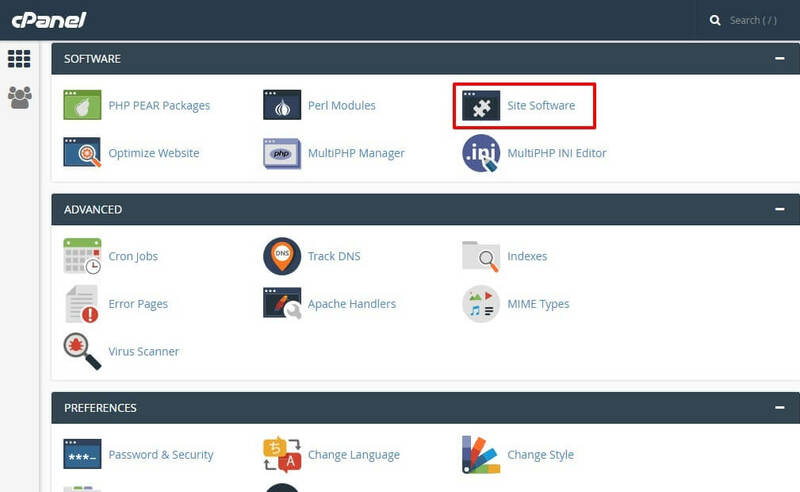 You can add a new domain name to your cPanel by following this guide. If you would like to re-install an existing Wordpress, please follow these instructions. 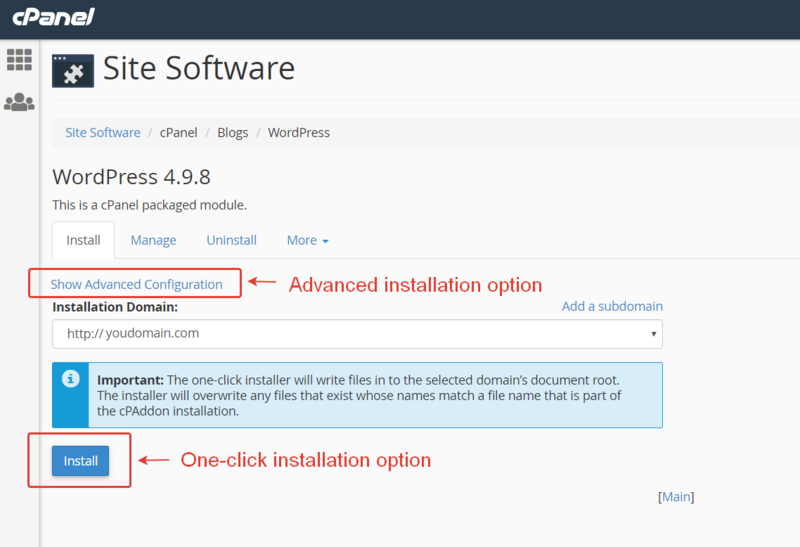 There are two ways to install WordPress - one-click option and advanced option. If you click Install button, the system will setup Wordpress with default settings: randomly generated login and password, Blog Name (My WordPress Website) and Blog Description (Just another WordPress site). To edit these settings before installation, choose Show Advanced Configuration option. If you select an Advanced option, make sure that the second field of Installation URL section is blank. You don't need to enter here anything, since you need to install WordPress directly into a domain’s document root. If you have more than one domain name connected to your hosting cPanel, please make sure that you have the correct name in the Installation URL field. Otherwise, select a necessary domain in a dropdown menu. Enter your preferred admin username, create or generate a password. Edit Blog name and Blog description fields to add your own data. To finish the installation process, click Install. 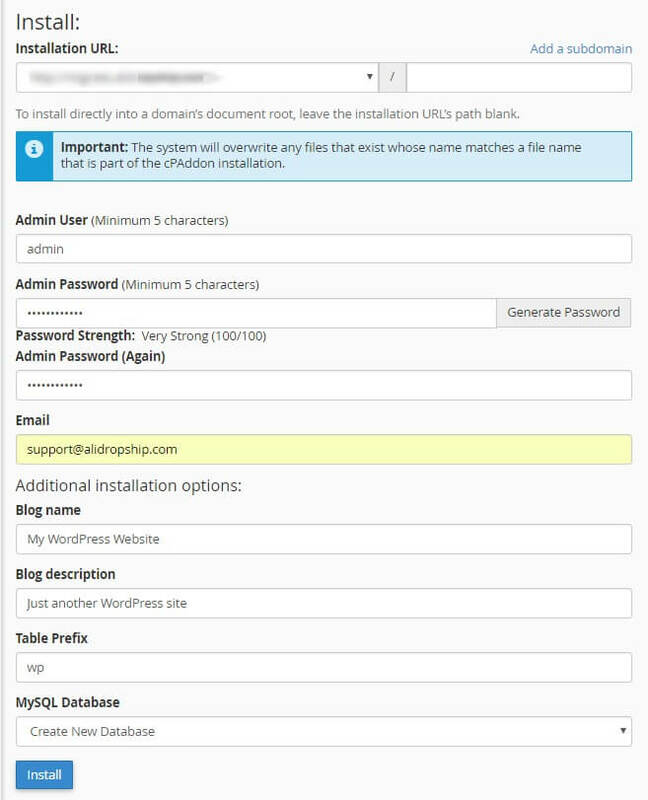 After the installation is completed, you will receive your WP login credentials to enter WordPress dashboard.